The Sassi di Matera (Italian for ‘Stones of Matera’) are two districts of Matera, well-known for their ancient cave dwellings. Located in the old part of the town, there are over 1500 cave dwellings within the steep ravine. This part of the city is built with buildings on top of buildings; having been carved into the mountain, the roofs of some houses provide paths to others. What you see on the surface is only 30% however, as 70% lies beneath the surface hidden in the catacombs of thecaves. Most of the caves within are now simply designed, modernised and yet traditional and unique accommodations, restaurants and shops for those who visit this beautiful city. 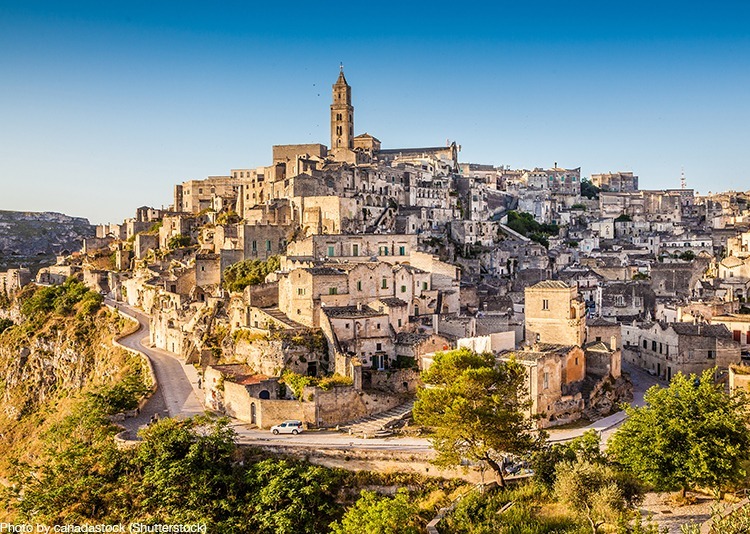 These picturesque stone buildings which make Matera so beautiful were not always a delight however, with Matera being seen as ‘the shame of Italy’ until the 1950’s when the government took drastic steps to increase living standards. 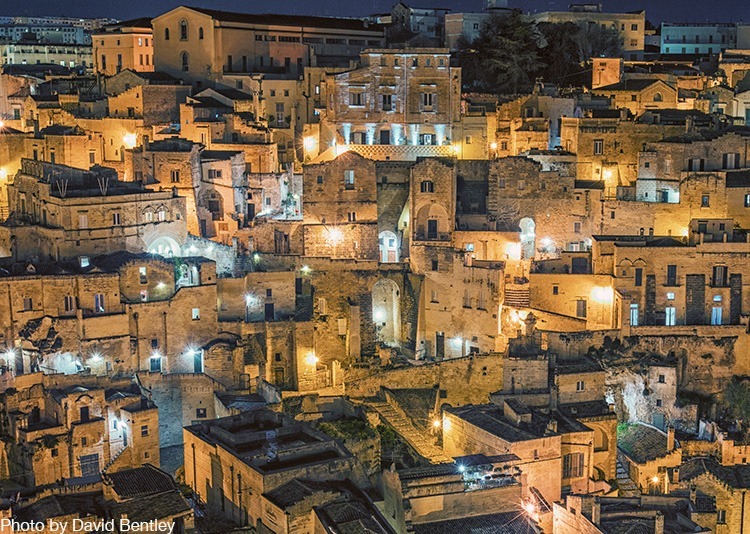 We are very glad they did, as Matera was named a UNESCO World Heritage Site in 1993, and has now been crowned a European Capital of Culture in 2019 – we couldn’t agree more! 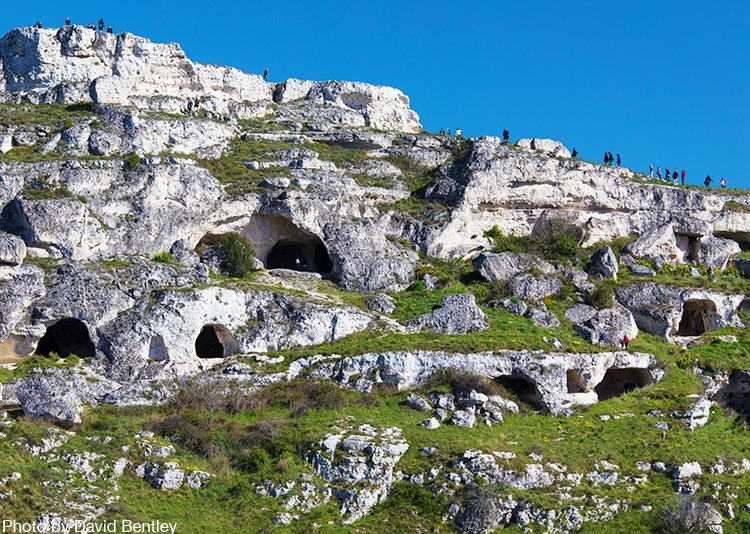 Another marvel of Matera are the caves which face the city on the other side of the La Gravina ravine, in the Materan Murgia Park. Once used as shelter for shepherds, some are brimming with incredible ancient frescoes and are a sight not to be missed. There is a foot bridge over the ravine for you to go and explore these magnificent pieces of history. The city is filled with numerous rupestrian (rock) churches with cave walls covered in frescos (plaster paintings) depicting the old and new testaments. These delicate but vibrant paintings date back to the middle ages and are awe-inspiring works of art preserved in the limestone walls. No touching though; the oil from our hands can disturb the fragile paintings. One church you can’t miss is the Church of Santa Maria de Idris which is carved into a large limestone cliff which sits slightly above the surrounding houses and was built in the 12th century. The Cathedral, or Duomo, is also a must visit. Built in 1268, it is dedicated to Santa Maria della Bruna, and has just undergone a massive 10-year renovation. Its large bell tower can be seen from afar, but the inside is where the real beauty lies. The rich Baroque interior has been remodelled several times, but is now a celebration of paintings and glistens with gilded frames. Below the city, Palombaro Lungo is a giant cistern open for 25-minute guided tours throughout the day. Lying beneaththe city’s main square it is one of Matera’s greatest attractions, with the guides explaining the history of the incredible water supply which is believed to be over 500 years old! 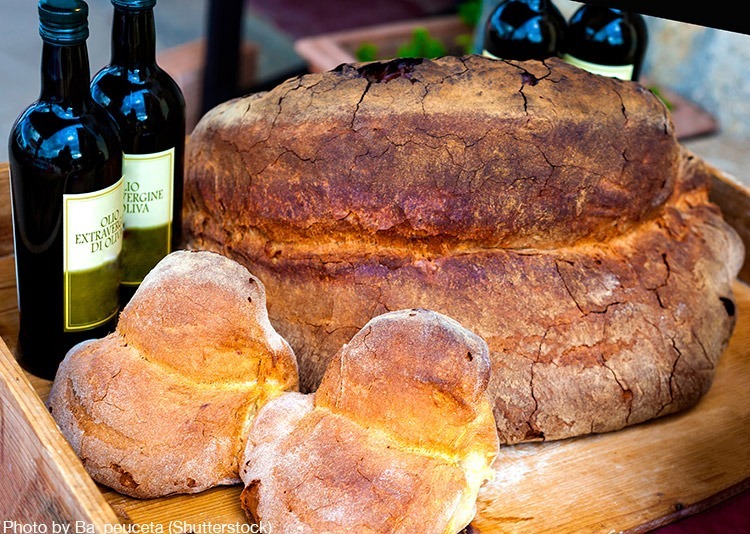 Matera has a special place in its heart for its bread. Specially made in Matera, this uniquerecipe can last up to 9 days; each day has a different taste and is better for use in different ways on different days. The bread of Matera is well recognizable thanks to its flavour, scent, and almost prehistoric dinosaur shape, as well as characteristic bubbles due to its slow leavening and woodfired baking. Due to the small size of the caves, the city has public/communal ovens in which the city’shousewives would bring their bread. In order to recognise whose was whose, they used bread stamps which are still produced in Matera (you can even learn to make one yourself). These would traditionally be the initials of the head of the house, and would have an ornate handle with the most commonly seen design being a rooster which resembled a strong male figure protecting the home whilst the man was away working in the fields. These bread stamps would also be used to propose to a woman – the man would present her with a bread stamp with his initials as a way of declaring his intentions to start a family with her. Due to its resemblance to Jerusalem, Matera has been a location for many, largely religious, films over the years, most prominently Mel Gibson’s ‘The Passion of the Christ’. Other notable film appearances include ‘The Gospel According to St. Matthew’ (1964), ‘The Nativity Story’ (2006) and ‘Ben-Hur’ (2016). The city has most recently appeared in ‘Wonder Woman’ (2017) and ‘Mary Magdalene’ (2018). If you just can’t wait to check out Matera, then our cycling holidays in Italy got you covered! If you’re a road cyclist, then why not embark on a cycling adventure to the ‘Heel of Italy’s Boot’, Puglia. This southern region of Italy is jam packed with flavoursome cuisine and unique architecture. For a more relaxed pace, check out our leisure cycling holiday in Puglia which combines glistening ocean views, authentic Italian towns and lush olive groves – a true treat on two wheels!